Although there are a number of books in this field, most of them lack an introduction of comprehensive analysis of MS and IR spectra, and others do not provide up-to-date information like tandem MS. This book fills the gap. 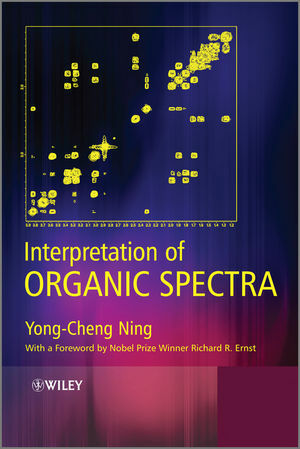 The merit of this book is that the author will not only introduce knowledge for analyzing nuclear magnetic resonance spectra including 1H spectra (Chapter 1), 13C spectra (Chapter 2) and 2D NMR spectra (Chapter 3), he also arms readers systemically with knowledge of Mass spectra (including EI MS spectra and MS spectra by using soft ionizations) (Chapter 4) and IR spectra (Chapter 5). In each chapter the author presents very practical application skills by providing various challenging examples. The last chapter (Chapter 6) provides the strategy, skills and methods on how to identify an unknown compound through a combination of spectra. Based on nearly 40 years researching and teaching experience, the author also proposes some original and creative ideas, which are very practical for spectral interpretation. Yong-Cheng Ning studied at the Engineering-Physics Department of Tsinghua University, Beijing, China where after his graduation he worked as a faculty member. From 1971 to 1978 he researched structural identification of organic compounds at the Institute of Chemical Engineering in Shenyang. Between 1981 and 1984 Yong-Chen Ning participated in research in NMR, MS, X-ray diffraction and alkaloid laboratories of the Institute of Chemistry of Natural Substances in Paris. Since 1993 he has been a full professor at the Tsinghua University. Yong-Chen Ning's books have won several awards, including the prize for excellent teaching materials, and are part of China's standard curriculum. His book Structural Identification of Organic Compounds with Spectroscopic Techniques (Chinese) was awarded the second-class prize for 'Excellent Teaching Materials' in 1992 and "Excellent Textbook for Graduate Students" in 2003 by the Ministry of Education of China.